I noted this link (Korea.net) today with interesting information on adoption of Korean flag. Including a June 29, 1942 date for adoption by the exile government of the flag. King Gojong appointed Bak Yeoung-hyo as his ambassador to Japan in September 1882. While aboard ship heading for Japan, Bak drew a national flag with a taegeuk circle but included only four trigrams instead of eight, and started using the flag on the 25th of that month. On October 3, Bak reported this change to King Gojong who formally proclaimed the Taegeukgi as the national flag on March 6, 1883. For some unknown reason, however, he did not have formal instructions published at that time on how to make the flag. In fact, it wasn't till June 29, 1942, that the provisional Korean government in exile enacted a law on the uniform method of making the national flag. The law was promulgated but as the government was in exile, it was not widely known to Koreans at home still under Japanese colonial rule. Standard color shades of Taegeukgi, the Korean National Flag are as follows: in the CIE System, the x, y, and Y coordinates for the red are x=0.5640, y=0.3194, Y=15.3; for the blue, x=0.1556, y=0.1354, Y=6.5. Alternatively, in the Munsell System of Color Notation, the red corresponds to 6.0R 4.5/14, and the blue to 5.0PB 3.0/12. In the Pantone Matching System, 186C red and 294C blue are recommended. Taegeukgi, the national flag of the Republic of Korea, consists of a blue and red yin-yang circle in the center, one black trigram in each of the four corners, and a white background. The white background of Taegeukgi symbolizes light and purity and reflects the Korean people's traditional affinity for peace. Geon, with three solid bars in the upper left-hand corner, denotes "heaven". Gon, with three evenly divided bars in the lower right-hand corner, denotes "earth". Gam, with one evenly divided bar on each side of one solid bar in the upper right-hand corner, denotes "water". And Li, with one solid bar on each side of one evenly divided bar in the lower left-hand corner, denotes "fire." I just opened by chance my Crampton's Complete Guide to Flags, 1990 [cra90f], just on the page where Korea is and noticed a sentence that did not sound familiar. So, it says: South Korea has kept the flag of the former Kingdom of Korea, although it has been modified. ... and the trigrams (kwae) are reduced from eight to four." So, what was the flag of the Kingdom of Korea with 8 kwaes? When did the change occur? This is perhaps the oldest representation of the South Korean flag. This was done eight months before independence by General MacArthur. I forgot to mention the flag is known as T'aeguk or "Great Polarity". The yellow flag charged with a black Chinese style dragon and blue clouds with red fringe. The flag is titled as Korean National flag in Flag Chart published in Japan in 1856 and 1871. The blue flag charged with a yellow Chinese style dragon with yellow border and red fringe. The flag is titled as Korean King Standard in Flag Chart published in Japan in 1876. Korean Flag 1882 from Flags of Maritime Nations published in July 28, 1882 by U.S. Navy. Korean Flag 1888 from Symbol of Korea published in 2008 Korea. I have a photocopy of an article by H.G. 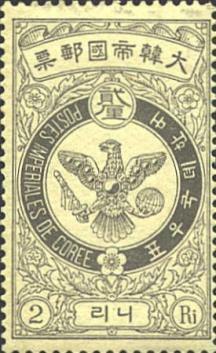 Ströhl called "Wappen und Flagge von Korea" in Herold, Oct. 1893, nr. 10, XXIV. It shows two flags. The first is labeled "Koreanische Flagge" and is like the modern flag, but the yin-yang - sign is much more intricate and the upper part is blue, the lower blue. According to the text normally only the 4 main kwae appear on the flag, most of the time blue. It also says that the arrangement of the kwae is not always the same. The second flag shown is the one flown at the Royal Korean Consulate in Hamburg, and has 8 kwae, coloured yellow. The yin-yang - sign is like on the modern flag, but rotated 90 degrees anti-clockwise. I have some doubts if the arrangement of these 8 kwae is correct, since two opposing kwae are not each others inversion. 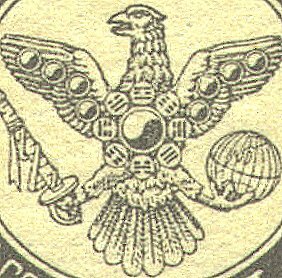 On the image of an old Chinese wind rose shown in the article they are inverted, so maybe that arrangement is more correct. It is interesting to note that the flag called the Royal Korean Consulate flag has a different arrangement of the trigraphs. I have noticed that the Koreans are very exact in describing the layout of their flag (10:15). Yet the flag that is flown on holidays is not of the same proportions as that shown in the official description of their flag, the main difference being the addition of extra white to the field of the flag on the side away from the flag pole. The additional material gives the flag the same length as the US flag (10:19). The ordering of the trigrams in the tooth edge flag matches that of the Hou Tian (latter heaven) ordering of the trigrams of the Chinese Yi Ching. During the Japanese colonial rule (1910-1945) the Korean t'aeguk circle flag was prohibited to use. The Japanese governor of Korea's flag was used that is light blue flag with Japanese national flag (hinomaru) in a canton like British blue ensign despite of a different color shade. The canton is one fourth of whole flag in size. The light blue stands for justice, fairness and philanthropy. Korea used a similar flag to present flag. The t'aeguk is longer than current one and colour was reverse: blue over red. The black four trigrams are placed in differently: There were two broken and one unbroken lines in upper left/ three unbroken lines in upper right/three broken lines in bottom left/one broken and two unbroken lines in bottom right. An old Japanese flag book published in 1876/1854 shows square yellow flag with red rugged border as a Korean King's standard. The flag bears a green dragon having red tongue and gray clouds. The early history of the Korean national flag seems to have remained rather obscure, according to a paper by Elizabeth Pyon published on-line in the Korea Herlad, 18 December 2001. The paper reports recent findings on the invention of the first Korean national flag, which seem to disagree with the traditional explanations. The research was done by Dr. Kim Sang-Sup, a "reformist" researcher specialized in the Yi-ching. Dr. Kim based his conclusions on several historical official documents of the end of the 19th century. The national Korean flag was used for the first time by a Korean diplomatic mission sent to Japan in 1882. This was the first diplomatic mission ever sent by Korea. King Gojong ordered the Chief of the delegation, Prince Pak Yeong-Hyo, to hoist the Korean national flag on the vessel used by the mission. These are historical facts. Moreover, it is often said that King Gojon himself designed the flag in the beginning of the 1880s. He wanted to express his resistance to foreign influence and his willing to preserve the independence of his Kingdom. Unfortunately, this theory is not backed up by any serious evidence. The historical records studied by Dr. Kim give a completely different history. In 1875, a Japanese fleet sailed too close to the Ganghwa Island and had an altercation with the Korean army. The Koreans shot the Japanese flag. This was used as a pretext by the Japanese army for a retaliation campaign. Before this event, there was little interest in Korea for a national symbol. King Gojong asked his suzereign, the Emperor of China, for advice on the question of the flag. Chinese experts suggested a flag similar to the Chinese flag of the time, a dragon with five claws on a yellow background. The Korean court, however, rejected the proposal of a dragon with four claws on a blue background, which was considered "too sophisticated". In April 1882, an official Korean-Chinese meeting was held to discuss the question of the Korean flag. The "teaguk" emblem was proposed for the first time during this meeting. Official documents of the Korean Royal court state that the Chinese delegate Ma Chien-Chung promoted the use of the Yin-Yang spiral in red and blue and eight combinations of the Yi-ching, and imposed his views to the Korean delegate Kim Hong-Jip. Ma Chien-chung explained the symbolism of his proposal. The eight Yi-ching diagrams matched the eight Korean provinces, and red was the colour of the King whereas blue was the colour of ordinary people. Korea eventually adopted its flag under Chinese pressure and used it for its first diplomatic mission as said above. The first version of the "taeguk" was very close to the original Yi-Ching diagram, which includes eight subdiagrams. The deletion of four of these subdiagrams is reported in the diary of Prince Pak Yeong-Hyo. The Prince showed the original flag design to James, the British captain of the vessel used for the mission. James found the design too complicated and proposed to delete four of the eight Yi-Ching diagrams. The oldest picture of a "Taegukgi," the national flag of Korea, has been discovered, giving insight into how the flag's symbols came to be used. The Taegukgi was found in the "Flags of Maritime Nations," issued by the U.S. Navy Department's Bureau of Navigation in July 1882, and with its red and blue yin-yang symbol and four black trigrams has the same form as the current Korean flag. This Taegukgi would be two or three months older than the one used by Park Yeong-hyo, who is known as the first to make and use a four- trigram flag. Park did so during a diplomatic mission to Japan from August to September of 1882.oldest Taegukgi, the national flag of Korea, was found. This version is listed in `Flags of Maritime Nations,' published by the Bureau of Navigation at the U.S. Navy Department in July 1882. This version uses the four trigrams from the Book of Changes. Until now, Park Yeong-hyo was known as the first person to use four trigrams from the Book of Changes. The flag was published two or three months before Park moved to Japan. Yoon Sojung reports on Korea.net, 29 February 2008, the discovery of a copy of the Korean national flag dated 1882. [...]Discovered in the National Archives of the United Kingdom, this copy of the flag was enclosed in a letter written by then-Japanese vice foreign minister Yoshida Kiyonari to U.K. ambassador to Japan Harry Parkes in November 1882, according to Korea's Independence Hall. In the letter, the Japanese vice foreign minister introduced the copy as the national flag of Korea to the British ambassador. This copy shows one of the oldest designs, which was originally created by Bak Yeong-hyo (1861-1939) during the Joseon Dynasty (1392-1910) in September 1882. Bak was appointed by Emperor Gojong (1852-1919), as Joseon's ambassador to Japan in September 1882. While aboard a ship heading for Japan, Bak drew a national flag with a taegeuk circle and included only four trigrams, and started using the flag on the 25th of that month. On October 3, he reported this to King Gojong, who formally proclaimed the Taegeukgi as the national flag on March 6, 1883. This copy has a taegeuk circle painted in red and blue representing the yin and yang that symbolizes universal harmony, one black trigram in each of the four corners and a white background. The white background of taegeukgi symbolizes light and purity and reflects the Korean people's traditional affinity for peace. The four trigrams of Geon, Gon, Gam, and Li, painted in blue in this copy, which surround the yin-yang circle, denote the process of yin and yang going through a series of changes and growth. The image of the flag copy, shown on "Korean.net" casts some doubt on the 1893 flag reported by H.G. Ströhl in Herold (above). Korean Flag 1899 from Flags of Maritime Nations published in 1899 by U.S. Navy. This flag might be national flag of Korean Empire (1897-1910). In The International Geography, London, 1911, I found this flag - the old flag of Korea, before it was occupied by Japan in 1905. Korea ceased to exist until 1947, after which a lot of things happened. They are colored blue in stead of black. The Yin-Yang - sign is much more intricate. I scanned the flag. Perhaps someone can tell us more about the 8 kwaes? This flag image is an incorrect representation, with the red part of the disc ending in a pointy tip and the blue part in a blob. The actual flag used a (rotationally) symmetrical device as in the left side image under "Korea, 1893". In 1906 Japanese Resident General Office was set up and the light blue Resident General flag charged with Hinomaru in the canton was adopted on February 14th 1906. The colour of light-blue symbolized justice, fairness and philanthropy. In the 1906 Army for justice led by Kho Kwang Soon in Chollanam-do used Taeguk flag with an inscription of "We will recover national sovereignty soon" when they fought against Japanese troops. This design was adopted later as a war flag of Recovery Army which was set up to smash Japanese troops and recover homeland sovereignty. The Resident General flag was abolished on August 22nd 1910 due to an establishment of Korean Governor General Office after Japanese Annexation to Korea. Since then Japanese National Flag Hinomaru had been used in Korea until August 15th 1945. The Taeguk flag was used as a symbol of Korean independence movement both inside and outside of Korea under Japanese rule during 1910 and 1945. The Taeguk flag with blue, red Ying-yang and black four kwaes was used in 1910. The Recovery Army government was established in Vladivostok in 1914. On March 1st 1919 Independent Banzai Movement in which two million people participated in the whole country took place and the Taeguk flag charged with black four kwaes was hoisted in Pyongyang. The Independent Army launched in Manchuria in the 1920's used a war flag of three horizontal stripes of yellow, red and light blue charged with Taeguk flag in the canton. It was unusual that the striped flag was used in Korea. In 1941 Independentist Kim Koo used a Taeguk flag different from the present national flag in black four kwaes and blue, red Ying-yang design. On August 15th 1945 Japan surrendered to the Allies and South Korean Military Administration was established by U.S.troops. The same flag as the present national flag except for shape of two kwaes was used in South Korea. I saw on TV recently what seems to be the first flag of the Republic of Korea. This was on the TV show M*A*S*H, a show from the 1970s, but set in the times of the Korean War. The flag references they have (the show is set on a US Army medical base) are quite accurate (i.e. a 48-star flag flies over the compound, along with a UN and S. Korean flag), so I don't doubt the authenticity of the flag. The flag was shown in a good shot in the episode "Welcome to Korea" (season opener of season 5. The major differences: the four corner elements are smaller and closer to the corner, and the ying-yang is on its side. The ying-yang also appeared to be drawn differently, but I couldn't get a clear enough shot of it to tell for sure how it appeared.